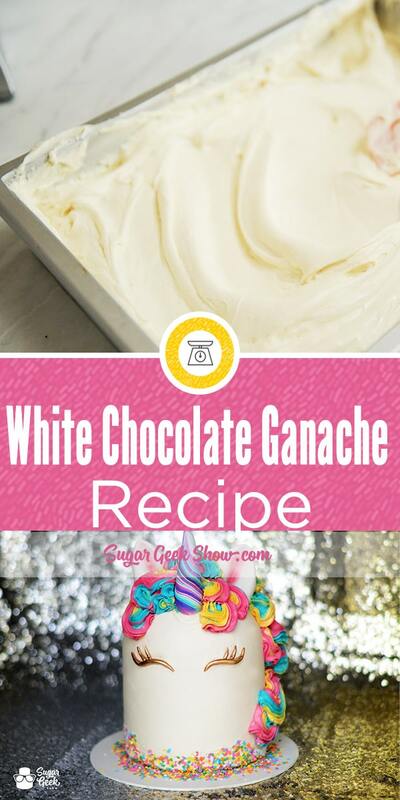 White Chocolate Ganache That Is Stable Enough For Icing Cakes And Tastes Delicious! 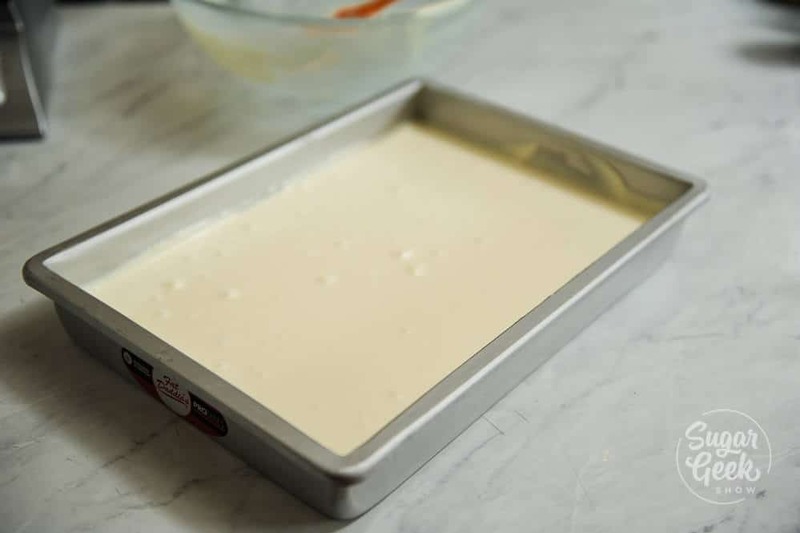 White chocolate ganache works great for making perfect drips on cakes, using as a glaze or for frosting your cakes instead of buttercream for a great vanilla flavor and is stable enough for using in high heat/humidity areas. Did you know white chocolate ganache doesn’t sweat? SO important on those super humid days. I admit that it took me a really long time to fully understand how to make white chocolate ganache and even longer to figure out how to make it perfectly. I always felt like it was working really well for others and I was somehow missing the secret to making the perfect ganache. It was either too soft, too grainy or too hard! What’s the secret? 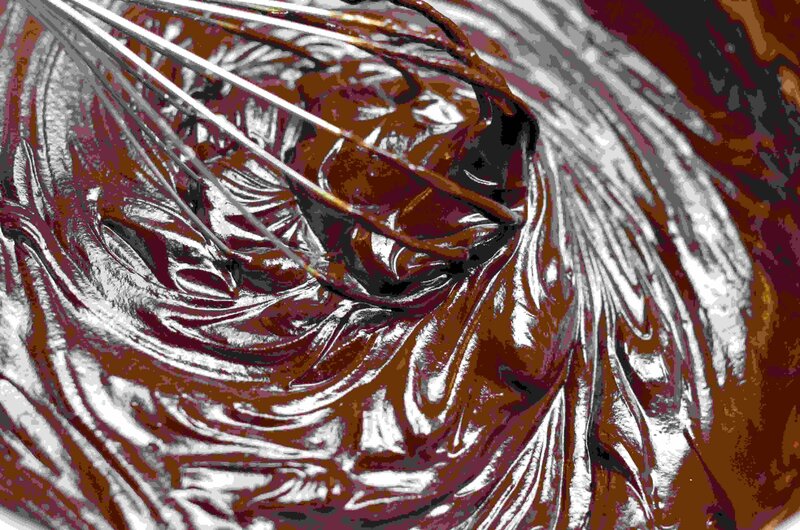 Turns out, the secret to making perfect ganache is time. Timing is everything! Ganache is made from chocolate and chocolate is very temperature sensitive. Too warm and it’s a drippy mess. Too cold and it’s rock hard. You need to use ganache at the right time. When you first make ganache it’s very soft and liquid. 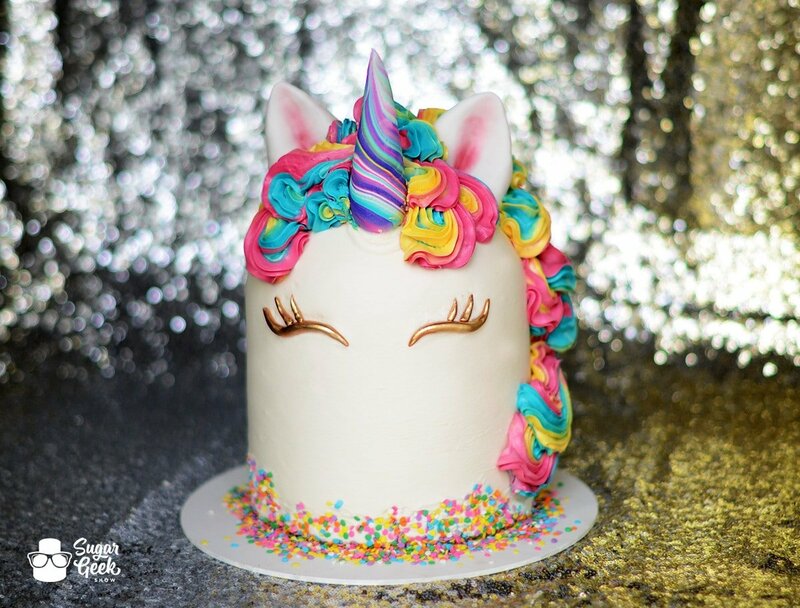 This is the perfect time to use it to make drips on your drip cake or for glazing your cold cake like my unicorn cake. When you let the white chocolate ganache sit for a bit, the cocoa butter starts to harden and the consistency starts to resemble peanut butter. To speed up this process, I got a tip from my friend Cynthia from Caked By Cynthia. She works exclusively with ganache in her high heat/humid area of Miami, Fl. She told me to pour my ganache into a shallow dish so the ganache cools quickly. Total game changer. Ganache is set in about 20 minutes to an hour depending on how cold it is in your room and now your ganache is ready to frost your cake! If your ganache get’s too firm, just microwave for 10 seconds and stir until softened. Be careful not to heat too much or you could split your ganache and you’ll have to wait for it to cool down all over again. 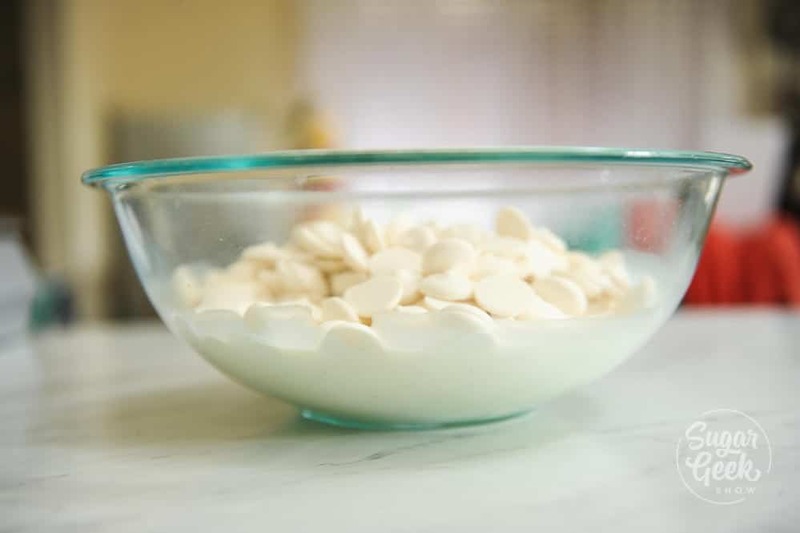 Making white chocolate ganache is super simple. I weigh out my chocolate (using a scale is better than using cups for accuracy) and place into a heat proof bowl. I microwave for 1 minute to start softening the chocolate. Then I bring the cream to a simmer and pour over the top of the chocolate. Make sure that your chocolate is covered by the cream. Let the mixture set for 5-10 minutes then whisk until combined. I poured my ganache into a cake pan to let it firm up. Took about an hour for me. Cover your ganache with some plastic wrap (so it’s touching the surface of the ganache) to keep a film from developing which can cause your ganache to be grainy. Once the ganache is at the peanut butter consistency, you can use it to ice your cakes. 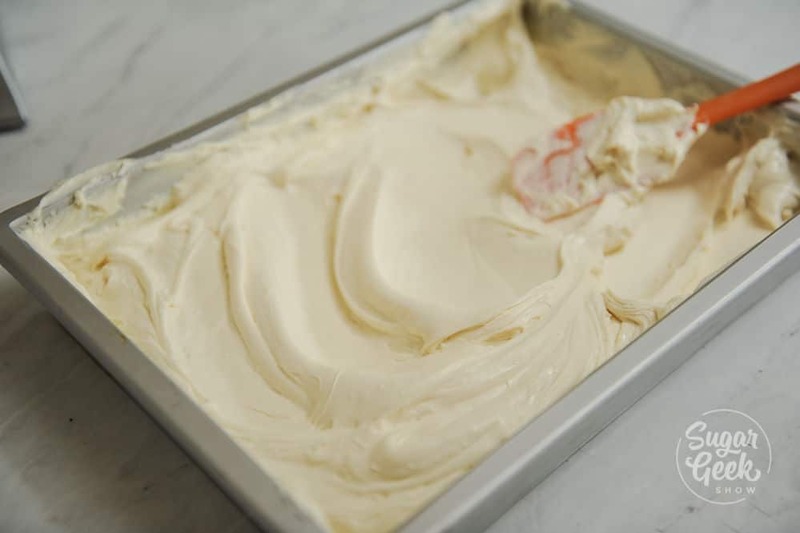 In general, white chocolate ganache can be kept at room temperature for up to two days but then needs to be refrigerated after that. Microorganisms need water to grow and ganache is mostly sugar and fat so it’s pretty shelf-stable. It can separate over time though so it’s best to keep it chilled when you’re not using it. I always store my ganache with plastic wrap touching the surface to prevent a film from forming. Then I heat in the microwave to soften and stir until cream before use. To glaze your cake with ganache, it’s important to wait until your ganache has cooled to 90℉. 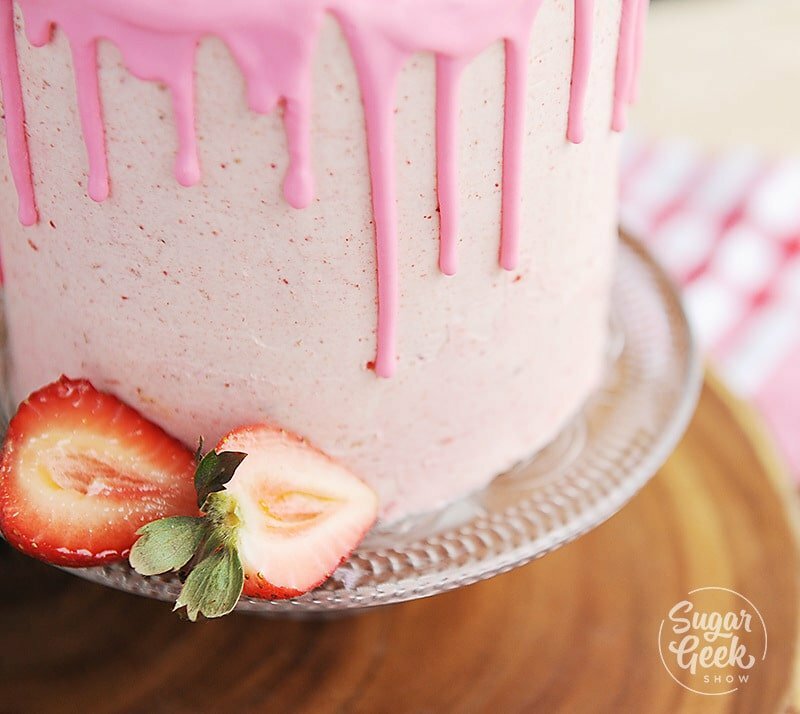 You can pour the ganache over the top of your frosted and chilled cakes for a super shiny and delicious coating! 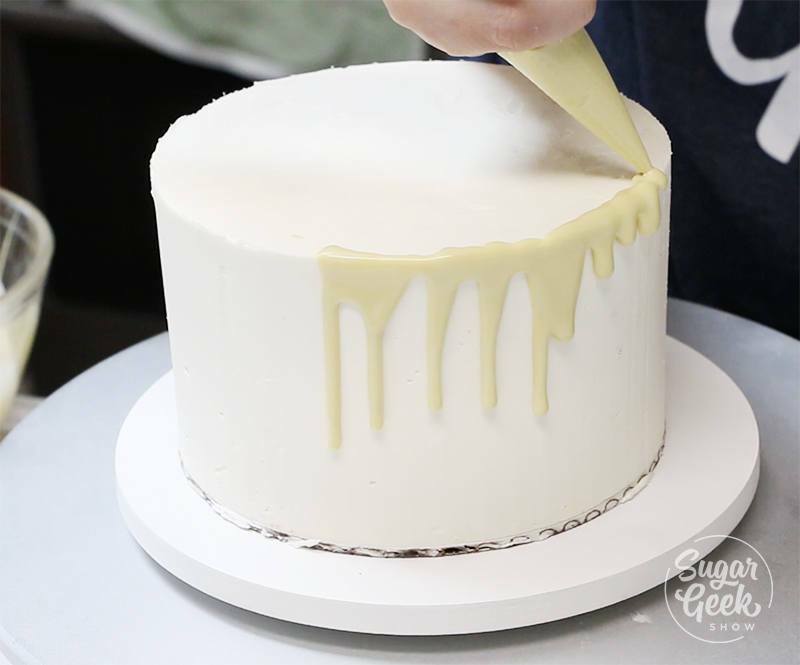 I use the same process for making perfect drips on my cakes! Or you can use water ganache which has a higher ratio of liquid to chocolate but is great in a pinch when you forget to buy cream at the store (guilty). You might often hear people talking about ratios like 3:1 or 4:1. What this means is the amount of chocolate to cream in a recipe. The reason it’s expressed as a ratio is because depending on how much chocolate you have will define how much cream you add. This way the recipe can be scaled to what you need. I usually go with a 3:1 ratio for my white chocolate ganache which produces a creamy but fairly firm ganache. Example, 3 lbs of white chocolate and 1 lb of cream. I am not in a super hot area though so if you are in a really hot/humid area, you might go with a 4:1 ratio so there is more chocolate in the recipe. The type of chocolate you use also can effect how firm your chocolate sets. Using real chocolate will result in a firmer chocolate. Using candy melts will result in a softer chocolate so play around with your ratio to see what works for you. Once you find a ratio you like, stick with the same chocolate brand for the most consistent results. 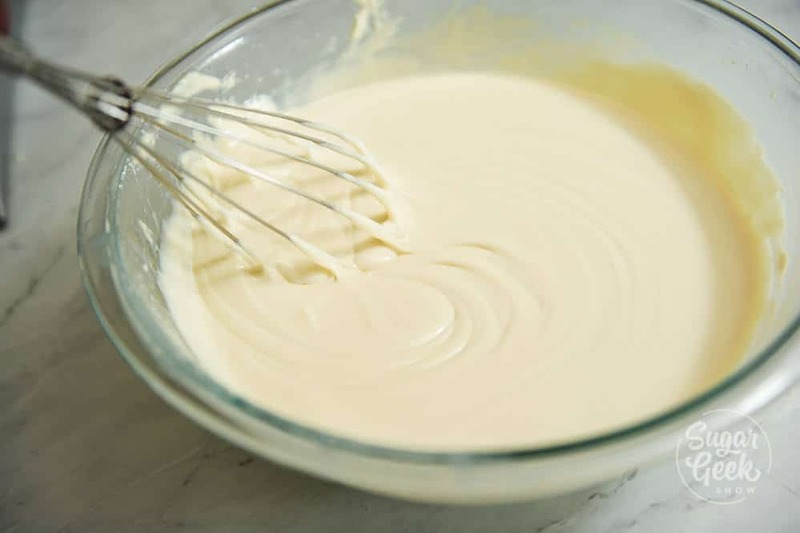 The great thing about white chocolate ganache is that you’ve already added liquid to your chocolate to form an emulsion which results in ganache. You don’t have to worry about your chocolate “seizing” by adding food coloring. You can add any food coloring you like to your ganache to color it but if you want some really rich and bright colors, I highly recommend using artisan accents chameleon colors which are formulated for coloring chocolate. They also work great for buttercream! 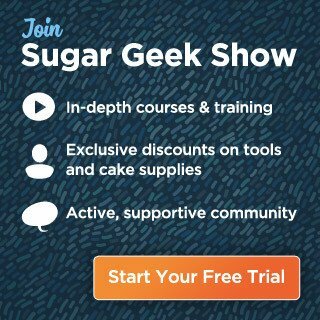 Do you love buttercream but want the stability of ganache? 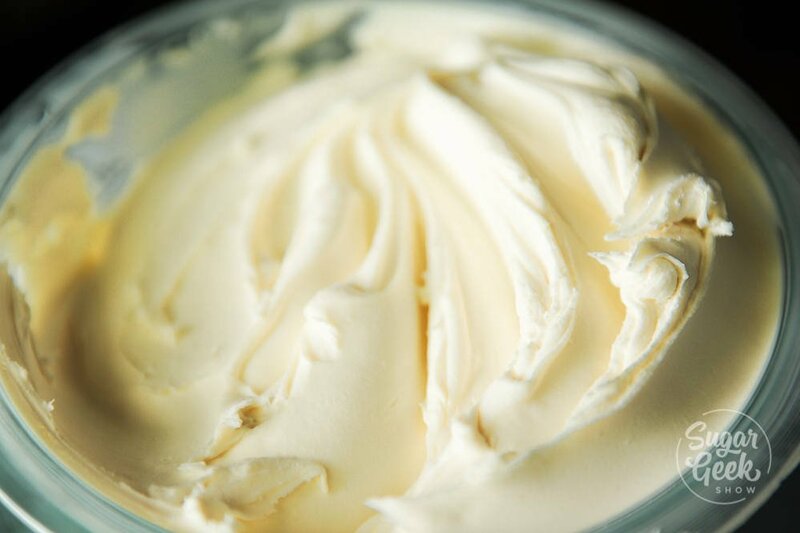 Get the best of both worlds from the white chocolate buttercream recipe! The white chocolate adds a delish vanilla flavor but also helps the buttercream set a little bit firmer than traditional easy buttercream. If you want to make some dark chocolate ganache, we have a great recipe for that as well! I love using chocolate ganache for a fudgy filling in my cakes or for adding great stability for stacked and sculpted cakes. 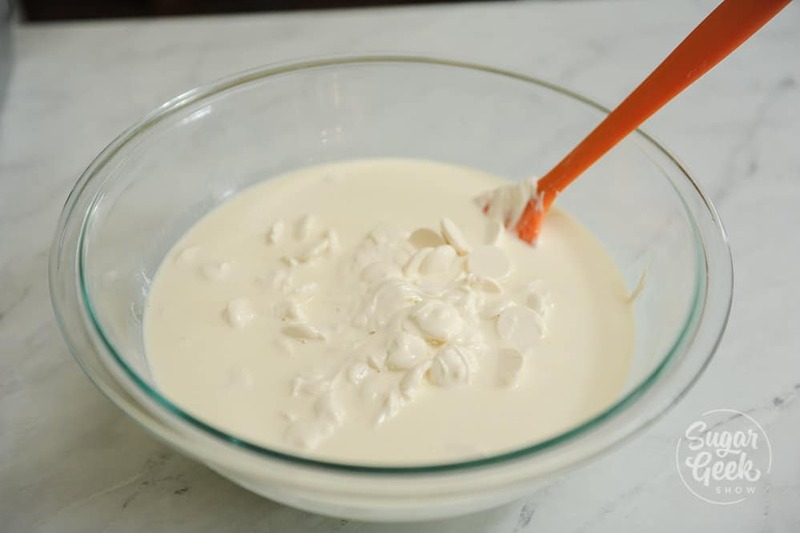 Watch my video on how to make white chocolate ganache! 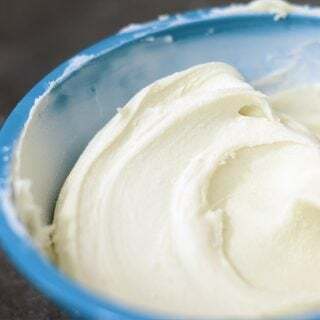 Learn how to make quick and easy white chocolate ganache that can be used for creating a flawless glaze or a delicious smooth frosting. Pour into a shallow pan or dish to let stiffen up. Then stir until creamy before icing your cake. If your ganache is too firm, microwave for 10 seconds to soften and then stir until ganache is the desired consistency. Love this tutorial! Works everytime! Please tell me what brand of white chocolate your prefer. It would help to show a picture of the bag please. I need to make a single 9inch round ganache drip cake and it’ll be my first time making it so I want some extra white chocolate in case i mess up the first time so how much white chocolate do you think I’ll need? I feel like making your full recipe with 240z will yield way too much ganache for me. I am frosting a full sheet cake (11×17). This this be enough or should I double it? I want to frost, not drip. Is it the Guittard Mystic or the apeels? Price difference is huge. What is the ratio of chocolate to the whipping cream? I never have much success when I make white chocolate ganache. There are so many conflicting methods, some say boil the cream to evaporate the water content, others say don’t boil the cream, add the chocolate to the cream, add the cream to the chocolate, whisk vigorously while some say whisk gently. All this is very confusing. Ive tried both the microwave method and heating the cream in a pan, adding it to the chocolate, leave for 5 mins and slowly stir from the middle of the bowl. Any ideas what I’m doing wrong. I use 3 parts chocolate to 1 part cream. Hi! Can sour cream be substituted in for heavy cream? I’m looking to us this as the top of a Christmas pudding Malteser cake. How long will the ganache last once on the cake? Does it need to be refrigerated? 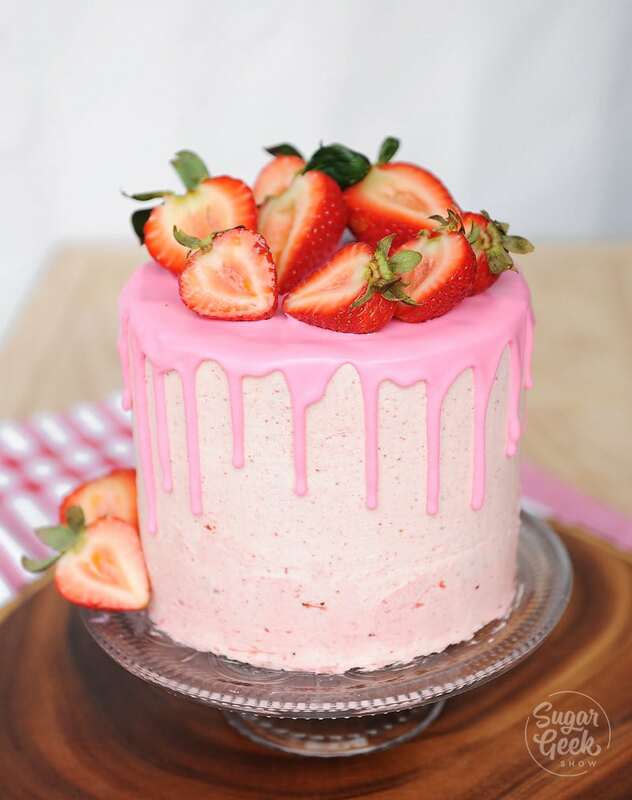 Could I flavour this with raspberry puree (using your strawberry puree recipe)? Hi, I am a somewhat experienced baker. I have successfully made milk and dark chocolate ganache many times. I have been asked to make a cake for a family member with white chocolate ganache and I cant seem to get it to work. No matter what do, it splits… badly and can’t be recovered. 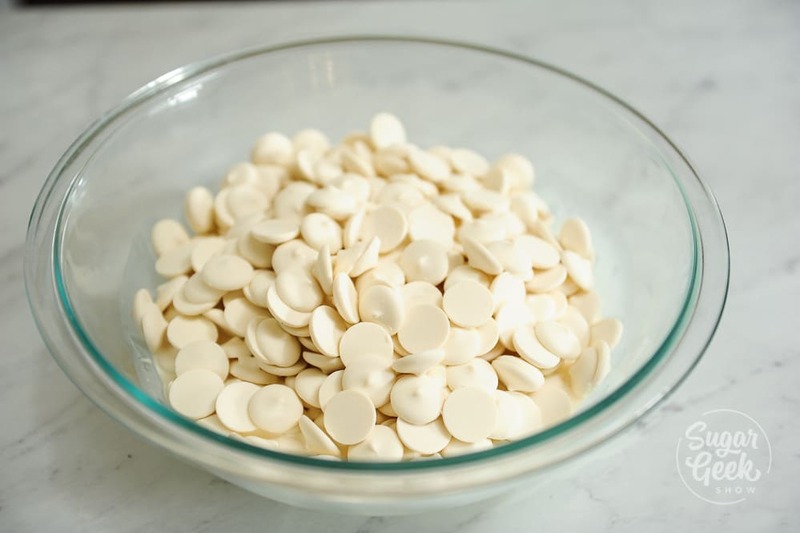 I am using ghirardelli white chocolate chips. I noticed there is no cocoa butter in them. Does the white chocolate need to contain cocoa butter to work in a ganache? No it doesn’t, try using a different type of chocolate or adjust your ratio. If it’s splitting you probably are using too much chocolate and need more cream. Hi, two questions: Are candy melts the same thing as chocolate? Can I use whole milk instead of whipping cream? Using as a dam to fill macs. Thank you! Can I add flavoring at the same time that I add food coloring? Was hoping to make a white chocolate lemon ganache but don’t want to mess it up! Tried making white chocolate ganache for the first time using 3-1 ratio and it worked perfectly. I am covering 7 and 6 inch cakes (3″ high each) in ganache. Will this recipe be enough for both? Is this stable enough for piping up the sides of a cake? Yes but you need to let the ganache cool to “peanut butter” consistency for piping. Do you have a tutorial on how to cover a cake with LMF after it has been iced with white chocolate ganache? Thank you. Do I use ganache as my icing on wedding cake? I had your video and thought I was using ganache under the buttercream icing. Now I am confused sorry. Wedding 6/29 in our backyard. I have used Guittards dark chocolate A peels to make ganache for under fondant and the Guittards dark chocolate A peels was great. Now I want to make white chocolate ganache for under fondant. I see above you use Guittards white chocolate A peels for drips. Can you also use Guittards white chocolate A peels for making a ganache that will be firm under chocolate? Thank you, but I don’t see on your site where it says Guittards white chocolate A peels. How am I missing that? But glad to know it’s okay to use. I meant to say will the A peels white chocolate be firm under fondant. Just used this ganache recipe to do a drip cake, only my third one. I kept stirring and thinking this isn’t looking right, crap! But I just kept stirring and voila, perfect ganache, dropped exactly right! Why did I ever doubt you, Liz??? Hi, can I use Americolour gel to tint the white chocolate ganache? I’m attempting a semi naked wedding cake, will your white ganashe be suitable for this, or butter cream? Hi! Will this work as well as chocolate ganache under fondant for sharp edges? (Where it won’t be too soft?) Thankyou! I am frosting two 3-layered cakes with this. Should I double or triple the recipe? Will be used for filling layers and crumb coat+smoothing coat. 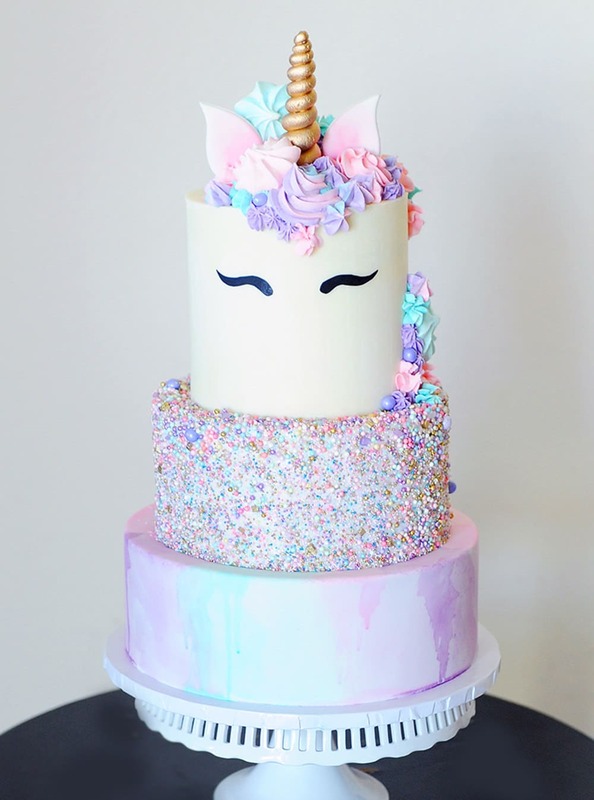 I’m actually making unicorn cakes similar to what’s in the blog! My friend wants a white chocolate ganache coating for her daughters birthday cake but in comes out too yellow to match to her chowed dusky pink roses.. can I colour with white powder colour and should I add it to the cream or after the ganache is made.